Now, forget about the 2G scam, coal scam and Vijay Mallya, these thieves stole something which even the Father of the Nation, beloved Mahatma Gandhi doesn’t have. Yes! you guessed it right, ‘the Nobel Prize’. Kailash Satyarthi is a renowned social activist and protection of rights of children and he was awarded the Nobel Peace Prize in 2014 for his priceless services along with Malala Yousafzai from Pakistan. Satyarthi is the founder of the Bachpan Bachao Andolan a.k.a BBA, an organisation dedicated towards the eradication of child labour and rehabilitation of the rescued child workers. Meanwhile, the 63-year-old Kailash is right now in the United States to attend the World Summit of Nobel Peace Laureates, thieves trespassed into his house in South Delhi and stole the replica of Nobel Prize along with many other valuable things. The incident took place during the Monday night and the case was filed at Kalkaji Police Station, a forensics team was called in to lift fingerprints and footprints according to the respective Deputy Commissioner of Police. Surprisingly, this is the second time something was stolen. Back in 2004, Rabindranath Tagore’s Nobel Prize for literature was stolen in 2004. 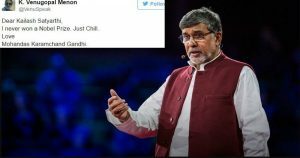 Kailash Satyarthi’s Nobel Prize replica stolen. The black market: some idiot is selling a Nobel with “A1 Top Engravers” label at the back. Nobel Prize Of #KailashSatyarthi Stolen From His Home At Delhi. Mai Bata Rha Hu Iske Peeche Bhi Modi ji Ka Haath Hai. I never won a Nobel Prize. Just Chill.